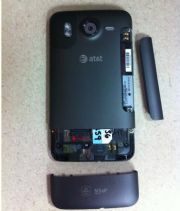 AT&T isn't exactly known for its hot Android lineup, but it has the HTC Inspire 4G ($100 with a two-year contract from AT&T; price as of 2/2/11), one of many 4G phones debuting this year that will challenge the iPhone 4 as the carrier's top dog. The Inspire 4G is essentially AT&T's version of Sprint's EVO 4G--minus the front-facing camera, kickstand, and HDMI-out. The Inspire 4G is a solid phone at an excellent price; shutterbugs especially will be pleased with the superb 8-megapixel camera. This is a bit finicky, but I'm not a huge fan of the way HTC has designed the SIM card and battery slots. Instead of a battery cover that's one removable piece, you have two different panels you must remove to get to these slots--and the battery slot was especially hard to remove and replace. I felt I had to use some force to get the piece to snap in--which is never a good feeling. The Inspire's unibody design is otherwise minimal, yet attractive, and it feels nice and solid in the hand. It is slightly thinner than the EVO and a touch lighter as well. The 4.3-inch WVGA display looks gorgeous and nicely showcases the HTC Sense overlay (more on that below). Beneath the screen, you'll find the typical Android buttons: Home, Menu, Back, and Search. On the bottom spine, you'll find the micro-USB port. The left spine has the volume rocker; the right is bare. The power switch sits at the top. Out of the box, the Inspire runs Android 2.2 (otherwise known as "Froyo") with HTC's custom-built overlay, called Sense, running over it. Hopefully, the Inspire will be updated to Android 2.3 sooner rather than later--an upgrade that should improve performance overall. I've written a lot about Android 2.2 and HTC Sense in other articles, so here I will just quickly summarize the important parts of the operating system. Of all the Android overlays, HTC Sense is the best-looking, in my opinion. The dynamic Weather app, in particular, is one of my favorites. The latest iteration of Sense features Leap, which is essentially an elegant way of handling multitasking; it's a bit reminiscent of Palm's WebOS deck-of-cards visualization (remember WebOS?). Pinch anywhere on the home screen, and you'll jump to seven thumbnail versions of screens for applications. From there, you can go to any of those open applications or close out of one. Friend Stream, HTC's social network aggregator, lets you view your friends' status updates, shared links, and pictures in one seamless view. Supported social networks include Facebook, Flickr, and Twitter, among others. I find this type of social network feed a bit annoying--do I need to see everybody's tweets and Facebook status updates jumbled together? If you're an avid social networker, though, seeing all of the updates in one place may be useful. The Inspire's version of Sense features htcsense.com, a Web-based service that adds an extra level of security to your phone. If your phone gets lost, you can use the site to track your phone on a map and send a command to make the phone sound an alert (even if your phone is set to "silent" mode). And if you can't track it down, you can remotely wipe all of the phone's data with a single command. With a 4.3-inch display, the Inspire is just begging to be your secondary television. But as I mentioned previously, the Inspire has no kickstand, so no table-top movie watching for you. It also has no HDMI port, so you can't watch content from your phone on your HDTV. Despite these omissions, the Inspire is a great media player, especially with the inclusion of Dolby Mobile surround sound. I sideloaded a clip of Iron Man on the Inspire and was impressed by how rich and clean the surround sound was. The Inspire 4G also supports Flash, so you'll be able to watch Flash videos, view Flash-enabled pages, and play Flash-based games. Flash sites loaded pretty quickly over AT&T's network, and videos ran smoothly. YouTube videos looked as good as they ever could, and the ability to easily switch between regular and HQ (High Quality) YouTube videos with a simple tap is very nice. One strange thing did happen: I paused a YouTube video, and when I tried to continue playing it, the video did not load. It gave me an error message and started the video back up from the beginning. I'm not a huge fan of HTC's Sense music player. The album art doesn't take full advantage of the Shift 4G's display while the app is in Now Playing mode; instead, the art remains thumbnail-size. The Sense player is slightly prettier than the dull-as-dirt Android player, but I prefer both iTunes and Samsung's TouchWiz player. Like the EVO, the Inspire sports an 8-megapixel camera with autofocus and a flash. Image quality was pretty good. My photos taken outdoors had bright, natural colors and crisp details. Photos shot indoors looked pretty good, though the colors were a bit oversaturated. Overall, I was pleased with both the easy-to-use camera user interface and the Sense Gallery. You can sync your photos with Flickr and Facebook, or load images or video via DLNA. Sadly for Picasa users, the Gallery app does not sync to Google's photo service. The camcorder can capture up to 720p HD video. The unit's videos looked pretty good, but it is unfortunate that there's no HDMI connector so you can watch your videos on an HDTV. The Inspire is not one of the dual-core-processor superphones we saw at CES (such as the LG Optimus 2X); it is powered by a 1GHz Snapdragon processor. With mobile processors getting faster and stronger, 1GHz now seems a bit, well, weak. Even so, the Inspire seemed to handle everything I threw at it speedily enough--minor YouTube hiccups aside. I had a hard time picking up a strong HSPA+ signal (or what AT&T is calling "4G"--see our dissection of what is and isn't 4G). This wasn't too odd, though, because I have a hard time picking up a strong 3G AT&T signal in San Francisco regularly. I ran the Ookla Speedtest application in San Francisco and achieved average download speeds of 0.31 mbps and upload speeds of 0.08 mbps. These speeds are typical of a 3G rather than a 4G network. Perhaps I got these results due to a weak signal here, but so far, I'm not impressed. I will continue testing in San Francisco in places where I get more HSPA+ bars and update this review if I get faster results. Call quality was good in San Francisco. Callers sounded loud, clear, and natural over the line. My friends said that they could hear very little background noise while I was standing on a busy city street corner. I experienced no dropped calls nor any static or distortion during my tests. The Inspire is an excellent addition to AT&T's lineup and is a solid Android alternative to the iPhone 4. The display, its good camera, and the variety of apps available in the Android App Market all make it an excellent phone for entertainment. I'm not totally convinced that it deserves the "4G" in its name, but that might be due to where I was trying to test the network. Still, "4G" implies speed, and while the Inspire certainly wasn't slow, it wasn't blazingly fast over the network either.